Do you know what a nanny dog is? A "nanny dog" is the name given to pit bull terriers many, many years ago. 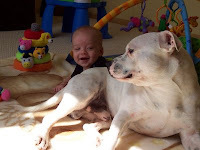 Pit bulls were called nanny dogs because they were loyal, caring companions for children. We have forgotten that their history is of a loving, caring family pet. They were treated as a part of the family. They were loved and respected and they gave love and respect in return. Todays' view of the pit bull is very different. They are viewed as aggressive and dangerous animals and have been banned in many places. The pit bulls that are aggressive have been trained by their owners to be aggressive. Their nature is to love and to please the people that own them. Our society blames the pit bulls. The blame falls squarely on the shoulders of the owners that train them to fight and to be aggressive. Dogs do not train themselves, people train them. Michael Vicks' recent trial and conviction for dog fighting is a step in the right direction. 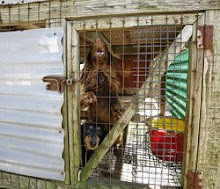 He was held accountable for his actions and the abuse of the dogs in his care. Every person that conducts themselves in such a manner should be held accountable in the same manner. The pit bulls should not be punished for their actions because of owners training them in inappropriate behaviors. Responsible dog ownership brings about very much different behavior in dogs. I hope that more people will remember pit bulls as nanny dogs in the future and give these dogs a chance to show their loving, caring nature. I will qualify what I am writing by saying that I am a pit bull owner and there is no more loving animal than my "nanny dog". Jordon needs a home ASAP!